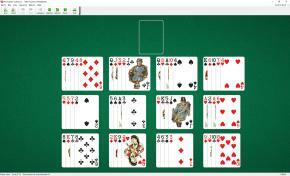 Take Fourteen Solitaire uses one deck (52 cards). You have 12 tableau piles. 5 cards are dealt to each of the first four piles, 4 cards are dealt to each of the remaining piles. The top cards of tableau piles are available to play.